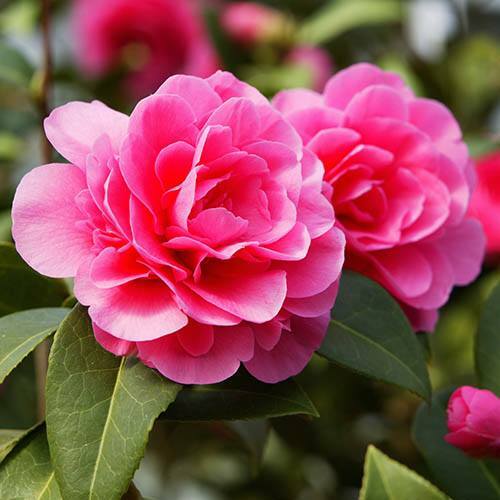 Early to flower, Camellia blooms are produced in abundance at the beginning of spring. Usually found in shrub format, this unique plant has been skilfully cultivated and grown into a lollipop standard shape, with a short stem beneath the flower canopy, ideal for pots and planters. It will produce beautiful blousy pink blooms that create layer upon layer of petals from around March time through to early summer. Supplied approx. 70-80cm tall on a straight stem, in a 3L pot. Nothing welcomes Spring like the swelling buds of a Camellia, it's bold & blousy flowers erupting as the days begin to lengthen. We have a lovely batch of 4 year old trees fashioned into a lollipop standard shape, with a short stem beneath the flower canopy, making it perfect for pots and larger planters. This slow growing evergreen has been skilfully cultivated with this in mind, for an elegant and unique look. Each Spring, the large buds swell up and erupt into large filled rose-pink flowers. Beware of early frosts though, the tree is very hardy, but the frosts can catch the early flower buds.